Few figures in Irish history have dominated their times in the way that Daniel O’Connell did. For three decades he personified the aspirations of nationalists and was revered by millions. The popular adulation that he enjoyed, however, was not a natural phenomenon that somehow ‘happened’. In many ways it stemmed from the deliberate and remarkably sophisticated efforts of O’Connell, his colleagues and the millions who supported him in Ireland and elsewhere. This was particularly apparent in certain visual and theatrical aspects of his political life. To the German writer Johann Kohl who visited Ireland in the early 1840s, O’Connell was the least private man in the United Kingdom. ‘He everywhere gives himself up to the gaze and judgment of the public’, wrote Kohl, ‘whether in parliament or at public meetings, in the streets, at elections, or in travelling. He scarcely ever ceases to lead a public life, and almost everything he does is done before the eyes of hundreds of thousands.’ Living his life on an open stage for so long made O’Connell practiced in the arts of self-fashioning and sensitive to the nuances of body image. As he grew into middle age, for example, he often lamented to his wife Mary that he was becoming fat. But despite her frequent words of comfort and despite repeated courses of dieting, horse-riding, brisk walks, and hot baths, O’Connell remained anxious about his spreading girth. He also showed concern about another physical matter associated with middle age: his baldness. It is not commonly acknowledged that from at least his forties onward O’Connell wore a wig. This explains an otherwise puzzling feature of his later portraits: namely, a luxuriant growth of dark and sometimes curly hair apparently sprouting from the head of a man in his sixties and early seventies. at this, the people began to laugh and looked at O’Connell for his reply. Dan did not take long to consider, but actually took off his wig and exposed his bald head, at the same time remarking that as his opponent wished to see his bare head, he was ready to favour him with a view of it; it had become bald in the service of his country, and therefore he was neither ashamed nor sorry for it…By this ready tact, and the fearless, frank disregard of himself thus displayed, he turned the laughter and the sympathy of the audience to his own side. O’Connell’s concern with his appearance also expressed itself in his dress and physical bearing. William Curran came upon him on the streets of Dublin in 1826 bedecked in what he called ‘the full dress of a verdant liberator—green in all that may and may not be expressed, even to a green cravat, green watch-ribbon, and a slashing, shining green hat-band’. This was probably a version of the uniform of the Catholic Association that O’Connell had helped to design. It anticipated other military-like costumes with which he would later become associated, including those of the Order of Liberators of Ireland and the 1782 Club. O’Connell’s most well-known item of clothing, however, was his celebrated green velvet and gold ‘milesian cap’ or ‘cap of liberty’ which the artists John Hogan and Henry MacManus created and which they presented to him at the famous ‘monster meeting’ held on the rath of Mullaghmast in 1843. O’Connell was seldom without this cap during the remainder of his life, even in private, and he publicly declared that he would wear it to his grave. Not surprisingly, his cap, his uniforms and other regalia became convenient targets of ridicule for British journalists, cartoonists, and others. The cap was a particular favorite with British artists who used it to suggest O’Connell’s buffoonery and childishness. But what did his distinctive apparel mean to his followers? Evidence suggests that many of them were profoundly moved. To the sculptor Patrick Byrne, the cap was so impressive that he immortalised it in stone when he carved O’Connell’s likeness for the label stop of the east door of St. James’ church in Dublin. Other craftsmen used the cap to promote O’Connell and his cause. These included the artisans of Cork who created an elaborate float that bore him through the streets of that city in a mammoth repeal demonstration in 1845. Rising from the vehicle’s four corners to a height of twenty feet were pillars that held aloft a large green canopy emblazoned with an enormous shamrock. Large replicas of the milesian cap crowned each of the pillars while an even larger version of it in green velvet with golden spangles topped the canopy itself. For those who saw them, O’Connell’s eye-catching apparel instantly summoned up a host of meanings. To his opponents, the milesian cap represented nothing less than a modern-day Irish crown and was symptomatic of its wearer’s brazen audacity. His followers, on the other hand, drew inspiration from the cap’s suggestion of Irish royalty—friendly journalists in fact referred to it as O’Connell’s ‘Crown-Cap’—and they easily related it to his popular sobriquet, ‘Ireland’s uncrowned monarch’. As newspaper reporters and manufacturers took pains to point out, the ornamentation on the cap was based upon that of an ancient Irish gold crown which had been excavated in County Tipperary in the late seventeenth century and taken to France by a dispossessed Catholic landowner. This naturally linked the cap with both the heroic and the tragic elements of Ireland’s past and was a tangible reminder of her legendary kings who ruled their country as independent sovereigns. These and other connections were rendered explicit on the ‘volunteer’ membership cards of the Repeal Association which were printed and distributed in the tens of thousands from 1843 onward. The bottom portion of each card showed a heap of abandoned instruments of violence—a shield, swords, a battle axe, a powder horn—and symbols of Irish antiquity in the form of an ornamental neckpiece and a pennanular brooch. Resting prominently on this pile of objects, as if to suggest its ultimate triumph over disorder, was the very gold crown which had been the inspiration for O’Connell’s milesian cap. Detail from a Repeal Association membership card showing a heap of abandoned instruments of violence. Note the crown (under the harp) which inspired the ‘Milesian Cap’. His uniforms also spoke a multi-vocal language. They summoned up images of Irish military valour from earlier times and, in so doing, they embodied the allusions to physical force that he sometimes sprinkled among his speeches to inspire his audiences. Because they were visual, they communicated instantly and directly with every member of his immediate audience. What is more, they resonated with special clarity in a culture that had become steeped in martial imagery. 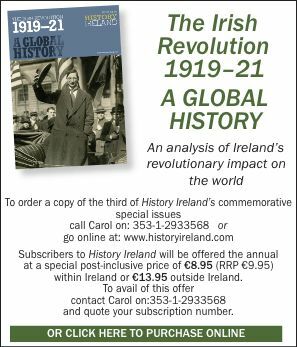 By the early nineteenth century, an unusually large proportion of Irish males had seen service in the army, navy and militia and, as Thomas Bartlett has demonstrated, ‘militarisation’ had become a defining feature of the emerging Catholic nation. O’Connell’s use of martial regalia automatically linked him with this powerful discourse and thereby helped to justify, as it underscored, the militant subtext of the repeal campaign in its later stages. If there be any procession [beforehand], the principal managers, three or four, should meet me in an open carriage with four horses. I would have my own and go into that carriage when I met the people. This is the most approved mode of conducting the imperator triumphans of a popular procession; with four horses a force is obtained just sufficient to get through the crowd….At the close of the procession, I would address the people from any well-arranged public vantage ground. Look to the strength and solidity of any erection used for that purpose either old or new. Let me speak with the wind. You will smile at these minuteness matters, but I know the value of attention to details. O’Connell’s supporters knew their value as well and they often orchestrated his appearances in ways that celebrated him and his accomplishments. During civic banquets, flaming gaslights spelled out his name above the head tables where he sat or they were arranged in such a way as to illiminate him dramatically. Large reproductions of his coat of arms and family motto typically hung from the walls alongside banners displaying laudatory epigrams, poems and familiar quotations from his speeches. O’Connell, standing on his ‘triumphal chariot’, celebrates his release from prison on Saturday, 6 September 1844. In fact he had been released the previous evening. At the commencement of one large dinner in his honor, a replica of a dove was made to flutter down upon his head as he took his seat at the table—a spectacle, reported one observer, that drew ‘peals of applause’ from the hundreds who witnessed it. By the 1840s, when almost every sizable town boasted at least one temperance band, indoor events invariably featured music that extolled O’Connell such as ‘O’Connell’s March’, ‘O’Connell’s Quadrille’, and the ubiquitous ‘Behold the Conquering Hero Comes’ which bands struck up as he entered the hall or made his way to the speaker’s rostrum. Theatricality even attended the public display of objects associated with O’Connell, as occurred at the monster meeting on the rath of Mullaghmast in 1843 when his milesian cap made its inaugural appearance. The cap was borne through the crowd in a special open carriage drawn by four gray horses and escorted by postillions ‘in caps and jackets of beautiful green velvet, richly embroidered with gold’, a scene that ‘excited a great sensation…as it advanced towards the platform’. A group of six gentlemen rode with the cap inside the carriage, all of them wearing identical copies of the headgear. They included the two artists who had designed the cap and a youth with a cornet perched upon the box seat playing the air ‘Don’t You Remember the Place Where We Met, Long, Long Ago?’, a pointed reference to the slaughter of Irish leaders on that spot in the sixteenth century. O’Connell was himself a master of one-man public performances. As crowds looked on, he literally kissed babies, hugged and kissed former comrades and wept openly and unashamedly when something that he saw or said moved him deeply. During processions through Dublin he was known to halt his carriage outside the former Houses of Parliament, rise, and point silently at the building as thousands cheered wildly. Certain of O’Connell’s appearances were paradigms of what the cultural historian Daniel Boorstin has called ‘pseudo-events’—spectacles that were made to appear spontaneous but that, in reality, were carefully planned and whose chief purpose was to gain attention in the media as they celebrated O’Connell. Such was the remarkable spectacle that his supporters staged to celebrate his release from Richmond Prison in the autumn of 1844. On the evening of Friday, 6 September, O’Connell walked out of the prison gates a free man and made his way alone and on foot to his house in Merrion Square through streets thronged with cheering supporters. These informal actions, however, were considered unworthy of such a momentous occasion: his discharge had to be commemorated in the ceremonial context of a symbolic liberation and a triumphal parade. Therefore, after spending his first night of freedom at home with his family, he arose early the next morning, returned alone to the prison and waited patiently for hours inside its walls as a mammoth procession made its way to him. Conspicuous near the front of the parade was a brightly colored, three-tiered behemoth of a vehicle. This was O’Connell’s so-called ‘triumphal chariot’ on which sat a costumed ‘Ancient Harper’ flanked on either side by O’Connell’s grandchildren dressed as medieval pages. Uniformed postillions controlled the six gray horses that pulled the vehicle. At the proper moment, the prison gates burst open and O’Connell, waving his green cap of liberty and an olive branch, emerged to music and thunderous cheers. He then climbed atop the chariot that became the centerpiece of a six-mile long parade that noisily wound its way back to the house he had quietly left that morning. The construction of O’Connell’s public image was obviously a complex enterprise that involved scores of his political colleagues as well as the millions who supported him. The meanings that clustered about O’Connell owed as much to his followers as to himself: people literally devised their own images of him as he fashioned himself for them. This was graphically illustrated in the myriad visual objects relating to O’Connell that ordinary people either made or publicly exhibited from the 1820s onward. They bore his likeness on thousands of hand-painted boards, signs and specially designed handkerchiefs during the Catholic Emancipation and Repeal campaigns. O’Connell figurines were produced in large numbers by Staffordshire and Shropshire potteries. They also represented him on elaborately painted banners that sometimes carried multiple meanings. A good example was the one that marchers in Clogheen, County Tipperary displayed in 1828 to celebrate his victory in the Clare election. It took the form of a large standard showing O’Connell standing next to King George IV beneath the motto ‘God Save the King’ but, as one spectator carefully noted, the word ‘King’ rested directly above the head of O’Connell. Other people used O’Connell’s image in ways that mixed politics with profit. Scores of pub owners displayed his likeness on large painted signs above their doors and drinking establishments were named after him in the Irish districts of English cities. From the late 1820s onward, English pottery manufacturers began to turn out dozens of items relating to O’Connell. In fact, he would appear to have been among the first political figures in the British Isles, other than members of the royal family, to have been depicted in commemorative pottery on a massive scale. These objects, which were aimed mainly at a middle-class market in Ireland, first began to appear in large numbers at the time of the Clare election. Throughout his career, Staffordshire and Shropshire potteries poured forth figurines, cups bearing his half-length portrait, salt-glazed gin-flasks modeled on his likeness, and similar stoneware flasks entitled ‘Irish Reform Cordial’. If advertisements in nationalist newspapers are any guide, publishers did a brisk trade in prints of O’Connell, some of which were made specially for insertion in women’s lockets and brooches. The appearance of new ones often produced a rush of subscribers as did sheet music and the publication of books by and about him. In the mid-1840s, thousands of his supporters openly identified with him by purchasing and wearing specially designed versions of his milesian cap. The construction of O’Connell’s image was a complex enterprise that was crucial to the process of nationalist mass-mobilisation. But what were the sources of this enterprise and to what ends was it directed? What meanings did people attach, say, to wearing an item that bore O’Connell’s likeness, or to buying a ceramic figurine, or simply to cheering a portrait of him on a parade banner? What was intended through the careful stage-managing of his public appearances and even through the ways that he dressed and moved? Two observations suggest themselves. First, it is obvious that the kinds of activities examined here were not intended to win converts to the nationalist cause among the majority population. Most Catholics did not need to be persuaded to support the Emancipation and Repeal movements. Second, these activities had even less to do with winning over O’Connell’s opponents who saw the mass meetings, the uniforms and the accompanying devices as confirmation of his demagoguery. What the campaign of image-creation did aim at was to personalise and objectify in the minds of its adherents, the nationalist project that developed from the 1820s onward. The construction of O’Connell was essentially an exercise in morale-building on a vast scale. Millions of his followers caught reflections of themselves and their aspirations in his various images and, in so doing, gained a new self-awareness if not a collective self-respect. That was by no means an insignificant accomplishment. Gary Owens is Associate Professor of History at Huron College, University of Western Ontario. G. Owens, ‘The Fabrication of Daniel O’Connell’, in Éire-Ireland (Forthcoming). G. Owens, ‘Nationalism Without Words’, in J. Donnelly and K. Miller (eds. ), Irish Popular Culture, 1650-1850 (Dublin 1998). O. MacDonagh, O’Connell: The Life of Daniel O’Connell (London 1991).